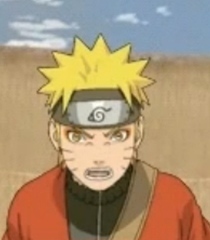 *shocked* Hi-Hinata... *angry* Why did you come out here?! Just run! You can't win!!! *trying to get her away* What's that mean...?! Hinata, don't put yourself in danger like this, just go!!! *flashback 1* I don't quit and I don't run! *flashback 2*THAT DOES IT!!! WHO GAVE YOU THE RIGHT TO HER WHAT SHE CAN AND CAN'T BE?!?! *flashback 3* Go on, Hinata!!! *flashback 4* I always thought you were gloomy, timid, terrified, and basically completely weird... *flashback 5* But ya know what? I actually like people like you~ *flash back 6* I never go back on my word!